Roch Mechatronics Inc. introduced world's best Shaker for Orbital shaking solution in Glass Flasks in Research Institutions, Workshops, Chemical & Agriculture Laboratories. It is a compact unit. 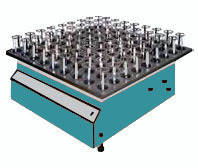 The heavy platform is fitted With rubber discs to hold conical Flasks for 50 ml. to 1000 ml. capacity. The platform is mounted on ball bearing crankshafts to give an orbital circular motion to flasks. The diameter of the orbit is approximately 2". The entire assembly is mounted on a metal casing which houses a motor coupled by means of V Belt with pitch pulley. The motor supplied is of Crompton/ Kirloskar or equivalent make.